Since its launch in October 2014, Apple Pay has been a huge success. It has support from a great number of banking partners as well as retail stores and gains new affiliates continuously. iPhone users are loving it and if you haven't tried it out yet, continue reading to learn about how it works and how to prepare your iPhone for it. You must have a compatible device with the appropriate version of iOS to use Apple Pay (iPhone, Apple Watch, etc.). If you're looking to perform an in-store purchase, you need to have iPhone 6 or 6 Plus because they are the only phones that are equipped with the necessary NFC compatibility. The next piece of hardware you'll need is a Touch ID sensor for in-app purchases — available on the aforementioned devices in addition to the iPad Air 2 and iPad mini 3. If you have one of these devices, you also need to update them to at least iOS 8.1 to activate the Apple Pay feature. Once your device is prepared, you have to set up a card to use for payment. Most major partner cards are affiliated with Apple, so you can link up your card to your Apple ID or just use it for Apple Pay. You may also add more than one card by launching Passbook and tapping the "+" button on the top-right corner of the screen display. You will then be asked to add a credit or debit card for Apple Pay and select "Add Another Card." Then, enter all your information in the fields or simply take a photo of your card using your device. No matter what, your iPhone should guide you through the set up process, including card verification, allowing Apple Pay access and Passbook storage. If you don't want to use your Apple ID card as your default, make sure to change it by going to Settings → Passbook & Apple Pay and then updating your information. Now that you're all set, you should understand how Apple Pay works. 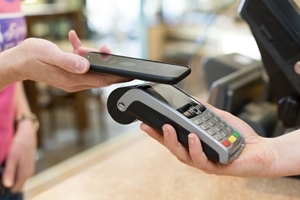 Essentially, when you're at an affiliated store, you'll hold up your device to a wireless payment terminal at the register and use Touch ID to complete the transaction. What's really attractive about this purchasing method is that you don't have to wake your device or launch an app. You simply hold up your iPhone and it automatically wakes the screen when in range of the terminal an initiates the payment process. If you or your company need help with iOS management or Apple support, reach out to MC Services today.